Today I want to share with you these fringed throw pillow covers I made in about 30 minutes. From start to finish. Before I do though, there is a bit of a story to tell. Sometimes it amazes me what shows up in my house. You’d think I would know what’s here…but I really don’t. When I was putting my Christmas decorations away in the basement, I happened upon this pouch. I swear I have never seen it before. I knew right away it was one of those blankets you take to a football game to keep warm. Clearly we had never used it. I also knew right away that it was coming upstairs with me because of the colors. I loved the shades of blue. Because I didn’t know how long it had been sitting in my basement, the first thing I did was wash it. As I was taking it out of the dryer I remembered making pillow covers for an Etsy customer a few years ago from a blanket just like this one. Once I had decided to cut the throw, I couldn’t get to my sewing room fast enough! All my pillow inserts are 20 x 20 (purchased at IKEA for $6.99) so that was the size I made these pillow covers. Here’s where I started. Basically a rectangle with fringe on each end. 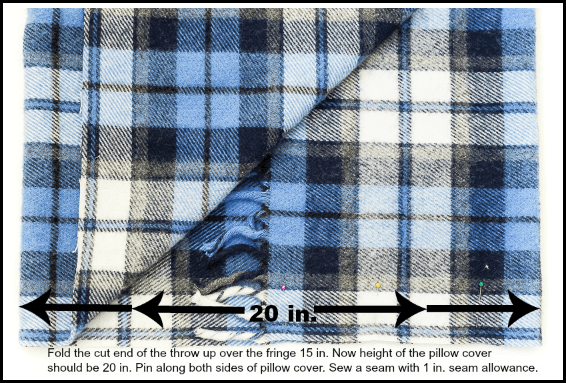 The good thing about plaid is you can follow the lines when you cut. Measure according to the diagram above. (I’ve learned the hard way to add a 1 in. seam allowance on all my pillow covers.) 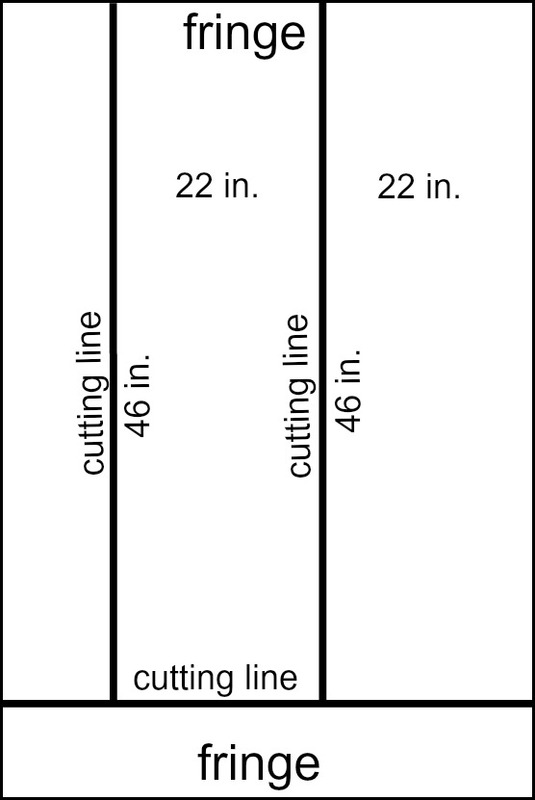 When you are finished cutting you should have two strips with fringe on one end that measure 22 in. wide and 46 in. long. Do not count the fringe in the length measurement. Lay the first strip out on a table, lengthwise, with the fringe on the right. Fold the end with the fringe over 11 in. Fold the other end, with no fringe, OVER the fringed end. Pin the sides so nothing moves around. Sew the side seams with a 1 in. seam allowance. 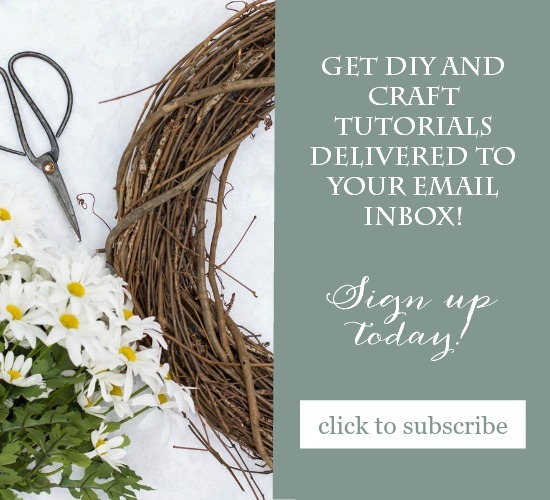 Now…if you are lucky enough to be making these with a wool throw, follow my How to Make Felted Wool tutorial so you don’t have to finish the seams. My throw was not wool at all so I used pinking shears. It was a little thick to fit through my serger so I opted for the pinking method. Repeat this whole process if you want two pillow covers. Turn your covers, point the corners and stuff the inserts. That’s it. I am so happy with the way they turned out. The blue in the pillow covers really brings out the blue plates on the wall. They add the perfect, cozy touch I was going for. 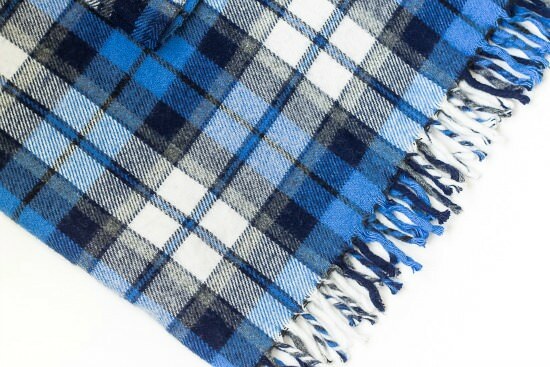 Chances are you don’t have a fringed throw hanging around your house. Thrift stores and eBay would be a great place to find one! Are you a member of the OSP family? Join us today! « What is a Printable? Love these pillows Ann!! What a great idea to re purpose the throw. I have some antique linen, but am having a hard time cutting it for projects. What a great re-purposing project! The fringe is really fun! I’m so glad to be a part of the tour with you! I love that blue with the yellow!!! Love the blue and yellow together- and those plates~ so pretty!! Blue is my favorite accent color for winter too! Your pillows are divine. So happy to be on the Cozy Home Tour with you! Great project — absolutely loved your comment about not knowing what you had in your house. I know the feeling!! I totally had to stop over after seeing these pillows on Pinterest. I loooove the blue. And I may be a bit biased because I made the cousins of your pillows last month from a vintage wool throw. Great minds really do think alike! Now, I just wanna find a blue throw to make more. They really are so simple. Ann, I just LOVE these pillows, and they look so fun to make!! I really love the blue too. Kind of the shades of winter, but in a warm soft pillow☺ Thanks! That pillow is absolutely gorgeous!!! It gives me a great idea! I’m very grateful for this tutorial, because IKEA has the grey fringed blankets and I am trying to add grey to my hubby’s office and sitting area and I need to make a long pillow or else two smaller ones. The grey blanket would be perfect! Thanks so much Ann!! Oh my I love these! They would be perfect in my living room and the fringe is perfect! Ann, you’ve done it again! These pillows are so cozy looking and the color is spot on with your plates! 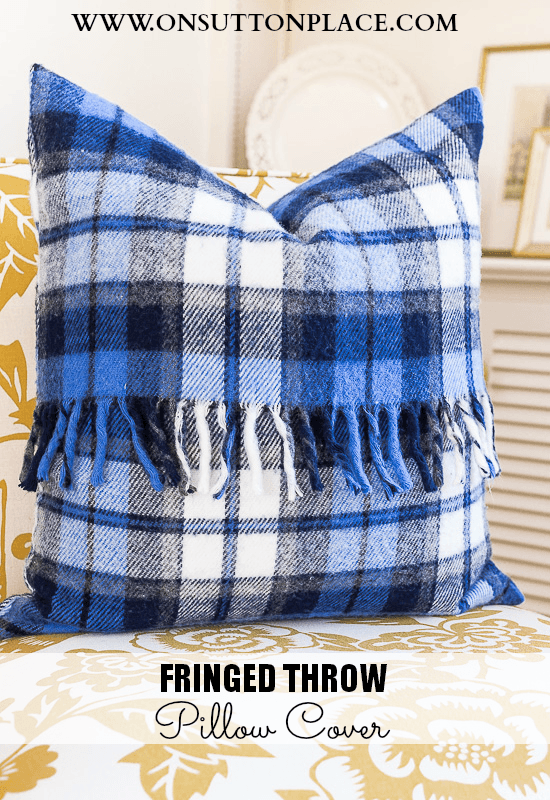 I think you will have a lot of people looking around for fringed throws on sale, including me! You always pick the best patterns and fabric, Ann! Love your fringe pillow!! What a great idea! Those pillows certainly do look cozy on your yellow chairs. Thanks for sharing. I love the design of your pillows. 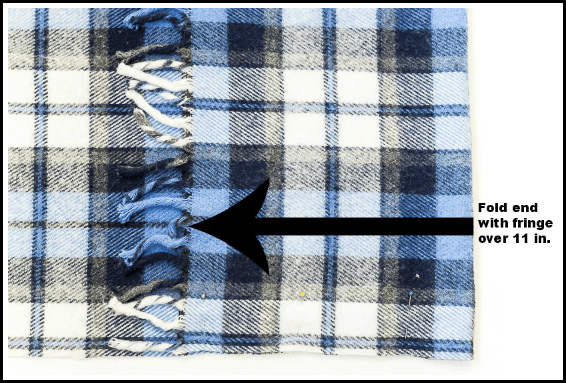 The blanket fringe adds such a pop of fun to the design. I’m sure to be on the lookout for a blanket now to make my own pillow covers. Ann your pillows are beautiful! Love the color and they look so soft and cozy! The perfect accent on those amazing chairs! So thrilled to be a part of the tour with you! These are so cute and snuggly! Perfect for winter! I love them and they are the perfect blue for your space. I think I have that same blanket in red lol but I wonder where it is. I love these! I am a big fan of plaid. Yesterday I found 2 acrylic tartan red throws for $12.00 each (full price was $40.00 each!) at Penneys. The bargains are out there! I am new to your blog and look forward to more awesome ideas! Oh cozy as cozy can be! I love those Ann! 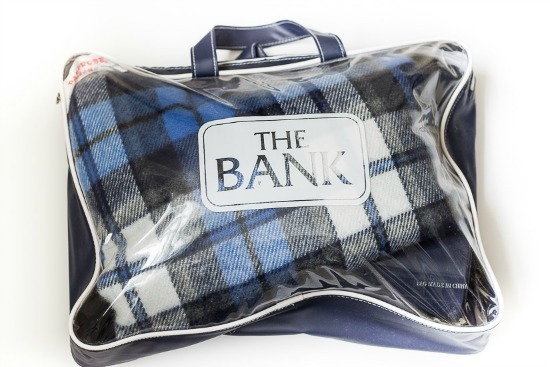 I have been looking for some wool plaid throws for a while, but the ones I see are all over $100. Ann — I’m in the process of redoing my studio in black white & blue so if your pillows go missing…. Just saying. Those are cute pillows, Ann. Funny finding that in your basement. No telling what I have around here that I don’t remember. I think I need to come over and check out what’s in your basement! What gorgeous pillows! And so perfect with your blue plates and wall design. Love it and love that the fringe is seen. Thanks for sharing your talents with us. I love these pillows, Ann! I especially like that you kept the fringe when you made them. You’re right – the colors look so pretty with your blue plates and yellow chairs. I really enjoyed partying with you at the Cozy Home Tour this week! We’re both using blue fringed throws! Love your pillows. Isn’t it so fun to find things we didn’t know we had! That throw just screams “cozy” – I love how you repurposed it into the pillows – just perfect for your room! I LOVE them Ann!! They look great on those chairs…that whole area looks so pretty! Ann, what a great use for your stadium blanket. LOVE LOVE LOVE the fringe! This type of pillow would look fabulous with almost any fabric! Thanks for the great diy! Your new pillows look amazing with your decor! Oh Ann, these are fabulous!! They look so warm and soft for winter, and I love them on your yellow chairs!! And yes, they draw your eye to the pretty blue plates on the wall. Perfect!!! 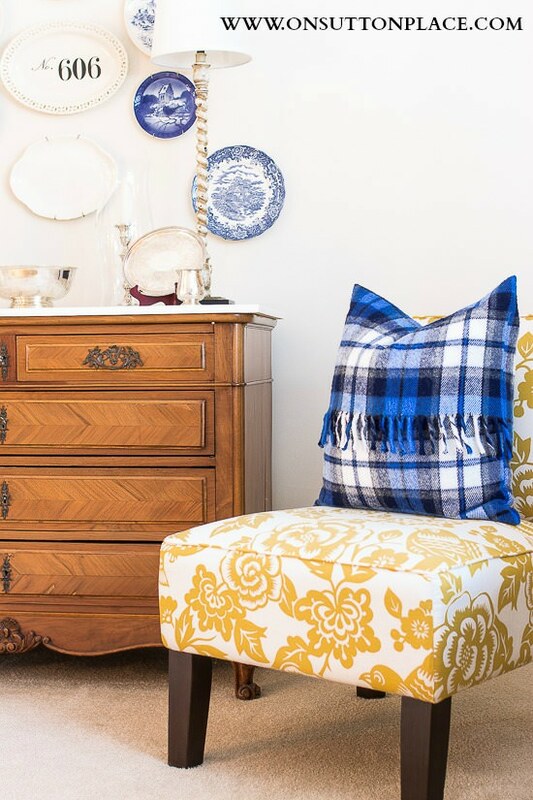 Oh you are certainly the creative one…beautiful pillows..I so love the blues and yellows in your room! What a great idea! They do really make your blue and white plates pop! I do love how the pillows make the blue plates pop off the wall. And I do have a couple of these throws laying around. perfect! looks wonderful on the chairs. What will you find next? PS- no links for the party are showing up. Ugh. Thanks for letting me know about the links. I think we got them fixed!